If you played in round one, you might want to skip round 2, as my goal is to send out as many of this one PC to as many folks a possible. THIS IS AN INTERNATIONAL SWAP. I bought a box of 200 of the exact same postcard in mint condition from a thrift store. It appears that the cards were first intended for an art museum to sell. My goal is to send many of them to new homes, in various ways. This swap will only help me send out 20 postcards on swap-bot, INTERNATIONALLY. I will do more rounds. This is a 20 partner swap. So you will be sending out 20 postcards. You will send the postcards, stamped naked and written on. When and if this swap fills up with 21 players, (I am one of the 21), then I will close the swap. It is limited to 21 players. The postcard each player will get from me is listed in the swap image. 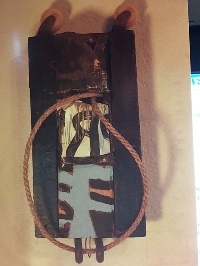 It is an art postcard, Will Saunders: Collage-boxes-planks-traps. wanderlust 1990. Scottsdale Center for the arts. If we get 21 playyers, You will need 20 postcards, and enough stamps for either the USA or INT partners you are assigned, Plus you need the time to write messages on the 20 cards. Please dont join if you cant afford the time, or postage. No they do not have to be the same postcard. It is senders choice. Pick a prompt: Write about the postcard, Write about your favorite artists, Write about your city, Write one or more of your favorite quotes. Yes, you can even talk about the weather, but please write a message. If we get less than 21 players you will or course send less postcards.